Joan is suspicious of a woman claiming to be a former associate of Holmes brother on Elementary. "All In" is the 19th episode of the show's fourth season. 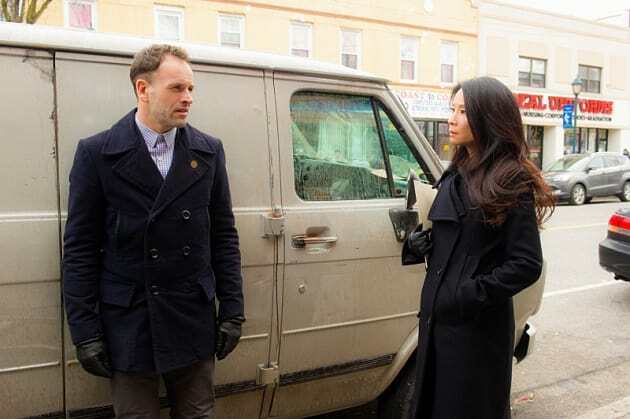 Elementary Season 4 Episode 19: "All In"
This is not a shelter for wayward and wounded realtors. I've got no desire to get shot by your pursuers. Or drawn into whatever complicated drama has drawn you here. Joan: This is seriously our next case? Sniffing out bribes in the wine auction world. Sherlock: New York is without a homicide this week. I'm terribly sorry that disappoints you. Permalink: New York is without a homicide this week. I'm terribly sorry that disappoints you.